I am actually quite excited about the release of the Parrot AR Drone 2.0. Every time I go out to fly now, I get someone coming along to look at the hexacopter and invariably I am asked “where can I get one?” and often “can I have a go?”, to which I have to say (politely) no. However, if I can buy one of these little chaps, I would probably be able to answer both of those questions positively. It is very tempting to have one in my car so that people can experience flying a drone. It has to be said, though, that if people are thinking of buying an AR Drone for commercial aerial photography, they are going to find the use fairly limited and, in the UK, are stepping into a minefield of legislation regarding aerial work. I can see some great uses for the AR drone. If you have a band and want to add some exciting shots to an amateur video, it would be great. However, with present technology, it just isn’t possible to get broadcast quality footage. Our octocopter is work in progress and I will add footage as soon as I am happy with it! In terms of endurance, the octocopter above won’t fly for much longer than the AR Drone. What you have to bear in mind is that the octocopter is capable of carrying a Canon 5D mark ii or equivalent for 15-20 minutes and it isn’t really fair to compare the footage. Now, the AR Drone is obviously going to be a lot cheaper but you do still need your smart phone or iPad to fly it. You will want to buy extra batteries otherwise you will have to wait for 90 minutes between each 10-15 minute flight. The range of the AR Drone is 30-100 metres depending on wireless signal strength. The octocopter has a range of 1500-2500 metres although there are restrictions over how far horizontally you can fly from the operator and how high you can fly. There is an excellent review of the AR Drone 2.0 here and also embedded below. I have also embedded some footage from an octocopter. Watch both videos in HD for best results! 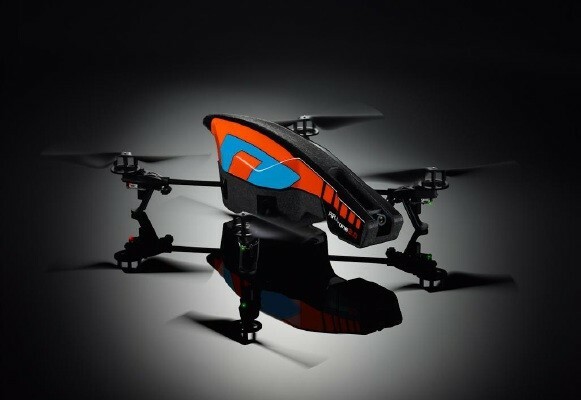 I think the new AR Drone is coming out in the UK this summer so if you’re a gadget freak and you want a funky toy to impress your friends, it could be for you. If you are serious about using these machines for aerial photography, save your money and buy yourself a little quad and a GoPro to get started and build your way up. Also, join a moel flying club to get some good advice and coaching. I would also suggest that, for a little light reading on the legislation, you head over to the Civil Aviation Authority website as pretty much everything the guy does in the AR Drone showreel is very dubious. Personally, I would rather not have a drone piloted by someone else that close to my face, particularly as depth perception is very difficult when flying from a screen! If I was piloting it, a different matter maybe. He also seems to be flying at quite some range – which is unlikely to work – and out of line-of-sight which isn’t allowed in the UK unless you have a competent observer with line-of-sight who can take control if you lose your bearings. Please do feel free to correct me on any of these points as I haven’t actually had the AR Drone 2.0 in my hands yet. It just seems that some of the news stories that are coming out this week, since the AR Drone being featured at the Gadget Show Live, seem to imply that it will be great for commercial aerial photography and I don’t think it will. The AR Drone may be a gadget but we will be using the octocopter professionally once we have our permission for aerial work in early May. We have got a couple of really interesting jobs lined up. Hi. I was just checking back through my old posts and found this. Have you seen how much use small unmanned systems are getting in film and TV production now? From the One Show to Top Gear and I saw one in use filming the new Alan Partridge film. As you can see from our showreel, although we have a long way to go, things have moved on immensely in the last year. Next month we have some new rigs and camera gimbals coming that will improve stability and image quality forwards significantly and we will be doing our fourth job for the BBC in the summer. The AR Drone continues to be a great gadget but will soon by ousted by the DJI Phantom I think.